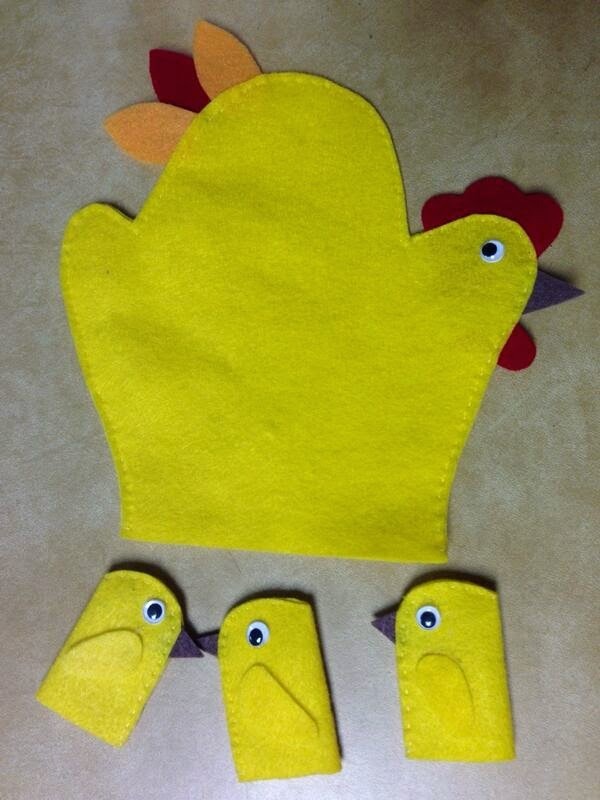 It's a full hand puppet, with a set of finger puppets that attach with velcro. Tami found the pattern online a few years ago, and saved the image, but no amount of Googling or reverse image searching led us to the original source. I'm afraid the blog she found it on was taken down. We searched diligently for the original source, but this is too cute not to share! And she clucks a song til they fall asleep (fold fingers to cover chicks, and make rocking motion while clucking a lullaby). My favorite part about this is clucking the lullaby at the end. I made a Vine to give you the idea, but since there's sound I will link to it instead of embedding it. Check it out here. I love songs and rhymes like this that give us a good opportunity to be silly. I like clucking, "Rock a Bye Baby" or "Brahms Lullaby" for maximum silliness. For some reason, this is one that parents really get into too--score! Themes: Farm, sleep/night, dinosaurs (closest living relative! ), birds, singing. I took the liberty of creating a template for this flannel set. If you'd like it, please email me and I will send you a PDF. My gmail address is opinionsbyanna. And finally, if you know where this came from originally, please let me know! This week's Flannel Friday Roundup is hosted by Katie at Storytime Secrets. To participate in upcoming roundups, or just find out what's what, check out the Flannel Friday Blog. This is an old post that I wrote, and, for some reason, never published. This was the culmination of my super fun and successful Spy Week that I did last spring break. I wrote about the passive station I did all week here and here, and this post is about the drop-in Spy Party I did on the last day. This was a super easy activity, that went over REALLY well: fingerprinting. Here's another example of my planning process, which I talk about here. In this case, I decided to save one of the activities for a different program (Angry Birds), since I realized I was over planning for this one. Observation test: This was really popular. I had a tray full of random items. The kids would look at it for 10-20 seconds, and then I would remove something and they would try to remember what was missing. They played it independently too, taking turns being the guesser and the hider. Book display: I had them take 5-10 minutes and look at the books I had on spies and codes. Then they wrote a cool fact on the poster paper I had out. Two Truths and Lie--regular game that was a good fit for the program. Lying Game--I don't remember what this was! See the post here for a list of all my resources and credit for many of the ideas I used.